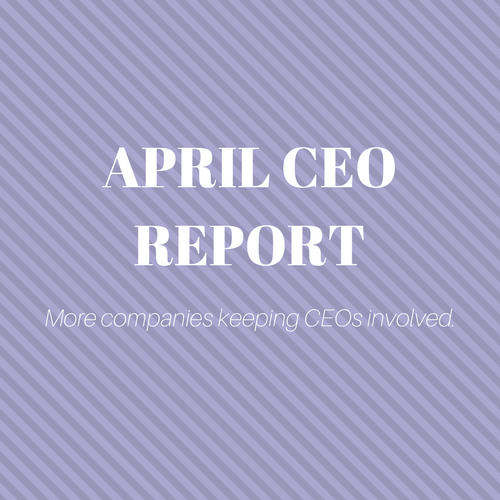 April CEO Report: More Companies Keeping CEO On Board | Challenger, Gray & Christmas, Inc.
April turnover fell 18 percent from the same month last year when 108 exits were recorded. For the year, 392 CEOs have left their posts, a 9 percent decrease from the 427 exits announced through April 2016. Government/non-profit organizations lead all sectors with 53 CEO changes this year, 11 of which occurred last month. This is a 29 percent decline from the 75 CEOs who left their posts in government/non-profit entities through April of 2016. Hospitals announced 48 CEO changes through April, while financial firms announced 40 exits. Computer firms accounted for 34 chief executive departures, and service companies saw 33. To date, 139 chief executive officers stepped down from their CEO position usually into a board position or an advisor role, 28 of which occurred in April. This reason was cited 40 percent more times this year than during the same period last year when 99 CEOs stepped down into other roles. “Many companies are opting to shift to new leadership by keeping the former CEO involved as an advisor. This gives the impression of a smooth transition under a unified direction,” said John Challenger, chief executive officer of global outplacement and executive coaching firm Challenger, Gray & Christmas, Inc.
“Other organizations are keeping the CEO in other C-level roles within the company, such as the chief tech officer or in business development. Many of these companies want a new chief executive to lead them during times of transition, but recognize the value of the predecessor,” said Challenger. Through April, 105 CEOs have retired, 65 have resigned, and 37 have found new positions at other companies. Twenty-three CEOs retired, and 14 resigned in April. Companies headquarter in California have seen the most turnover this year with 50 CEO departures, 9 in April. Texas had 14 CEO exits for the month while Wisconsin saw 6, and North Carolina reported 5.